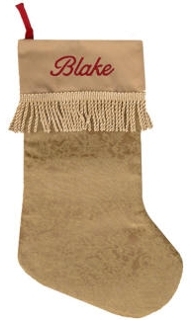 Monogrammed stockings are the perfect touch to finish up decorating your mantle. We offer a huges selection of stockings, sure to fit any budget or taste. Buy one for every family member. Decorate your mantel with personalized Christmas stockings for the whole family. Maroon and green color combination look great with a traditional home decor. Add a metallic gold for a little sparkle. A delightful Christmas stocking to hang on your fireplace. Available in two coordinating color schemes - with an olive or red body. 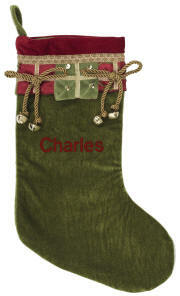 This luxury Christmas stocking is detailed with brocade, sequins, and jingle bells on a braided trim. 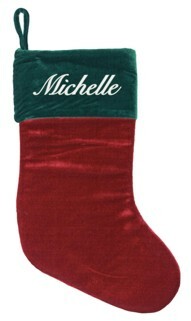 We personalize on the body of this beautiful Christmas stocking. Beautiful Christmas stockings ready to decorate your mantel or staircase. 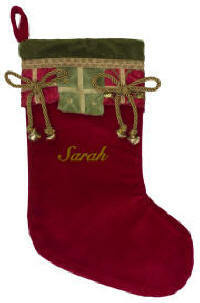 A set of two, these stockings can be personalized for every family member. 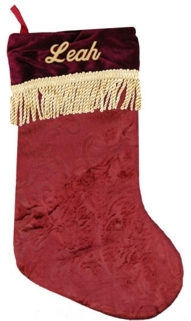 An elegant stocking decorated with sequins, brocade, braid and jingle bells.